CHICAGO--(BUSINESS WIRE)--Apr. 12, 2018-- USG Corporation (NYSE:USG) today sent a letter to stockholders urging them to vote the WHITE proxy card “FOR” the election of USG’s highly qualified independent directors, in connection with the Company’s upcoming Annual Meeting of Stockholders (the "Annual Meeting") to be held on May 9, 2018. Recently, Gebr. Knauf KG, a private German company which is a 10.5% stockholder in USG and a competitor in the global gypsum market, sent an open letter to all USG stockholders asking you to vote against four USG Board nominees who are up for election at the upcoming Annual Meeting of Stockholders on May 9, 2018. This is a misguided attempt to pressure the Board into accepting a proposal from Knauf to purchase USG, that we believe is substantially below our intrinsic value. The Board will not yield to this pressure and is committed to acting in the best interests of all USG stockholders even in the face of Knauf’s campaign. The Board is committed to creating value for all our stockholders through the execution of our strategic plan, which we outlined at our recent Investor Day. While the Board has not made the decision to sell the Company, it remains open to the evaluation of any proposal to acquire USG, as it has done with Knauf’s proposals. If Knauf, or any other viable bidder, makes a proposal that reflects the Company’s intrinsic value, the Board would seek to negotiate an appropriate confidentiality arrangement to allow it to share information with the potential counterparty. The USG Board has declined to share confidential information with Knauf because, in addition to being a competitor, Knauf’s acquisition proposal is not at a value that the Board believes adequately compensates all stockholders. To be clear – Knauf’s campaign is designed to undermine the Board’s ability to maximize value for all stockholders. This vote, which has no legal bearing on any corporate action or the retention of the incumbent directors, only serves as a propaganda tool for a competitor who is unwilling to pay an appropriate value for your Company. On November 29, 2017, Knauf first proposed to acquire USG for $40.10 per share, which represented a 9% premium to our prior day closing stock price. After careful evaluation, our Board rejected this proposal and USG management subsequently spoke with Knauf to explain the Board’s rationale and elements that impact USG’s intrinsic value. Our stock traded as high as $41.18 in January 2018 – unaffected by public takeover speculation. On March 8, 2018, we held our Investor Day (which had been under development since mid-2017), where we outlined our strategy – Knauf representatives attended in person. On March 12, 2018, at Knauf’s request, Steven Leer, our non-executive Chairman and Jennifer Scanlon, our CEO, met with Alexander Knauf and Manfred Grunke, Knauf’s Managing Partners, in person. Three days later, Knauf submitted its revised proposal of $42.00 per share, which was then only a 2% premium to our recent 52-week high. Our Board again carefully considered and rejected this revised proposal on the basis of USG’s intrinsic value, which has been increased by the materially positive impact of the reduction to U.S. corporate tax rates, which had been signed into law after the initial Knauf proposal. On March 26, 2018, in connection with a letter outlining the rationale for the rejection of Knauf’s offer, we suggested a further call with Knauf’s leadership team, which took place on March 29, 2018. Following the March 29, 2018, call, the Board directed USG’s financial and legal advisors to meet in person with advisors from Knauf, which took place on April 5, 2018. On April 10, 2018, Knauf issued a letter to USG stockholders claiming – among other things – that the USG Board did not engage in good faith with them. This is clearly not true. Knauf’s letter to USG stockholders focuses on a decade-old history of USG, which includes the period of the great recession and housing bubble, and is completely irrelevant to where the Company is positioned today. The reality is that our Board and management team have completely transformed our company, most significantly in the last two years, resulting in a drastically improved cost position, profitability, capital structure and portfolio. As an example of 10 years of dramatic change, consider that our 2017 Adjusted Operating Profit was approximately two times greater than our 2007 Adjusted Operating Profit, with housing starts approximately 11 percent lower. Knauf is well aware of these facts and is trying to mislead you. 1. Non-GAAP Metric. See reconciliation to GAAP results in the Appendix. 2. Non-GAAP Metric. Net adjusted debt/adjusted EBITDA. See reconciliation to GAAP results in the Appendix. USG is now a pure manufacturer with an enhanced portfolio and greater exposure to the highest growth construction markets in the world. This transformation has positioned us for significant growth and value creation ahead. Our favorable cost position is improving further through advanced manufacturing, which we expect to deliver $100M of run-rate EBITDA by the end of 2020. Our advanced manufacturing initiatives and other cost efficiency efforts are powerful levers that are independent of market conditions and are already funded in our plan. Recent innovative product launches are gaining meaningful traction due to strong customer demand, and are expected to deliver significant upside over the next few years. Exciting additional new products are in our pipeline. These innovations drive continued differentiation and support USG’s price premium in the market. As reflected in the chart (see attached), management expects its strategy to result in improved adjusted operating profit margin. This clear potential is, in part, why we view Knauf’s proposal as opportunistic. Knauf is attempting to scare USG stockholders by claiming we will have to make significant capital investments, but in fact significant investments have been and are being made, and we expect to generate more than enough cash to fund capex needs in the coming years while also retaining the ability to return capital to stockholders. Our transformation, including the sale of our distribution business, expansion into Asia, Australasia and the Middle East, and reduction of debt, has dampened out our cyclicality. In addition, the initiatives underway will drive meaningful value regardless of where we are in the cycle. Knauf is a private German company which has been in existence for 86 years, with stated net sales in excess of $8 billion and EBITDA in excess of $1.6 billion. While Knauf has operations in many regions of the world, it does not have a significant presence in North America and, in particular, the U.S. gypsum market. Knauf stands to benefit substantially from a combination with USG, as its proposals reference “compelling strategic logic” and its principals acknowledged its expectation of meaningful synergies for Knauf. USG’s #1 market position in North America and industry leading technology, patents and brands, such as our Sheetrock® brand, make us the “crown jewel” of the industry, and we are critical for Knauf to achieve their goal of being the global leader in wallboard. Indeed, it is this technology and intellectual property portfolio that Boral sought and placed a high value on in the formation in 2014 of our highly successful USG Boral joint venture. Vote the WHITE card “FOR” the re-election of USG’s highly qualified and experienced director nominees: Jose Armario, Gretchen R. Haggerty and William H. Hernandez and our new director nominee: Dana S. Cho. Your Board and management team have successfully transformed USG to position the Company for the significant opportunities ahead. We are confident that we have the right strategy, the right management team and the right Board of Directors in place to continue delivering value for all USG stockholders. Your vote is important and we strongly urge you to protect your investment by voting “FOR” on the white card today. On behalf of USG’s Board of Directors, we thank you for your ongoing support, and look forward to continued engagement. In this letter, the Company’s financial results are provided both in accordance with accounting principles generally accepted in the United States of America (GAAP) and using certain non-GAAP financial measures. In particular, the Company presents the non-GAAP financial measures adjusted operating profit and margin, free cash flow, EBITDA and leverage ratio, which exclude certain items. The non-GAAP financial measures are included as a complement to results provided in accordance with GAAP because management believes these non-GAAP financial measures help investors’ ability to analyze underlying trends in the Company’s business, evaluate its performance relative to other companies in its industry and provide useful information to both management and investors by excluding certain items that may not be indicative of the Company’s core operating results. Adjusted operating profit includes the equity method income from USG Boral Building Products (UBBP) and USG’s income from other equity investments because management views UBBP and its other equity investments as important businesses. 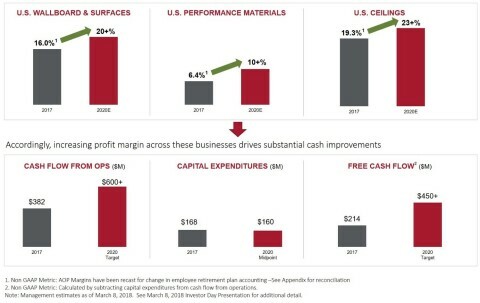 In addition, the Company uses adjusted operating profit and adjusted operating margins as components in the measurement of incentive compensation. The non-GAAP measures should not be considered a substitute for or superior to GAAP results and may vary from others in the industry. For further information related to the Company’s use of non-GAAP financial measures, and reconciliations to the nearest GAAP measures, see the Appendix. 1. Amounts are Unadjusted for the sale of L&W (not recast to reflect L&W supply as a discontinued operation). 2. Reported GAAP operating profit and adjustments are as presented in the 2007 Form 10-K.
1. Excess cash is based on a 75% ratio of cash, cash equivalents, and marketable securities. 2. Represents adjustments to GAAP debt and unadjusted EBITDA to arrive at a proxy for adjusted debt and adjusted EBITDA as used by the ratings agencies. 1. Depreciation, depletion and amortization excludes the amortization of deferred financing fees which is included in interest expense. 2. GTL operated as an internal cost center prior to 2011, and thus did not drive a material consolidated EBITDA impact. This letter contains forward-looking statements within the meaning of the Private Securities Litigation Reform Act of 1995 related to management's expectations about future conditions, including but not limited to, statements with respect to our expectations regarding the future impact of our strategic initiatives and future value upside, statements regarding the indication of interest made by Knauf and uncertainties regarding future actions that may be taken by Knauf in furtherance of such interest, margin expansion and doubling our free cash flow by 2020, advanced manufacturing returns, upside delivered by recent innovative product launches, generation of cash to fund capex needs and return capital to stockholders, the microenvironment and its impact on our strategy, and the value driven by initiatives underway. In some cases, forward-looking statements include, without limitation, any statement that may project, indicate or imply future results, events, performance or achievements, and may contain the words "expect," "intend," "plan," "anticipate," "estimate," "believe," "may," "will be," "will continue," "will likely result" and similar expressions. Actual business, market or other conditions may differ materially from management's expectations and, accordingly, may affect our sales and profitability, liquidity and future value. Any forward-looking statements represent our views only as of today and should not be relied upon as representing our views as of any subsequent date. Actual results may differ materially due to various other factors, including future actions that may be taken by Knauf in furtherance of its unsolicited proposal, economic conditions, such as employment levels, the availability of skilled labor, household formation, home ownership rate, new and existing home price trends, availability of mortgage financing, interest rates, deductibility of mortgage interest and real estate taxes, consumer confidence, job growth and discretionary business investment; competitive conditions and our ability to maintain or achieve price increases; the loss of one or more major customers, including L&W, and the increasing number of our customers with significant buying power; increased costs, or decreased availability, of key raw materials, energy or transportation; unexpected operational difficulties or catastrophic events at our facilities; our ability to successfully operate the joint venture with Boral Limited, including risks that our joint venture partner, Boral Limited, may not fulfill its obligations as an investor or may take actions that are inconsistent with our objectives; exposure to risks of operating internationally; our ability to innovate and protect our intellectual property and other proprietary rights; our ability to make capital expenditures and achieve the expected return on investment; a disruption in our information technology systems; compliance with environmental and safety regulations or product safety concerns; the outcome in legal and governmental proceedings; the ability of a small number of stockholders to influence our business and stock price; our ability to successfully pursue and complete acquisitions, joint ventures and other transactions to complement or expand our businesses; significant changes in factors and assumptions used to measure our defined benefit plan obligations; our ability to return capital to stockholders; the occurrence of an “ownership change” within the meaning of the Internal Revenue Code; our ability to pursue strategic opportunities without increasing our debt and leverage ratio; the effects of acts of terrorism or war upon domestic and international economies and financial markets; and acts of God. Forward-looking statements speak only as of the time they are made, and we expressly disclaim any obligation or undertaking to update these statements to reflect any change in expectations or beliefs or any change in events, conditions or circumstances on which any forward-looking statement is based. Information describing other risks and uncertainties affecting USG that could cause actual results to differ materially from those in forward-looking statements may be found in our filings with the Securities and Exchange Commission, including, but not limited to, the "Risk Factors" in our most recent Annual Report on Form 10-K. In connection with USG's 2018 Annual Meeting of Stockholders, USG has filed with the U.S. Securities and Exchange Commission (the “SEC”) a definitive proxy statement and other documents, including a WHITE proxy card. STOCKHOLDERS ARE ENCOURAGED TO READ THE DEFINITIVE PROXY STATEMENT AND ALL OTHER RELEVANT DOCUMENTS WHEN FILED WITH THE SEC AND WHEN THEY BECOME AVAILABLE BECAUSE THOSE DOCUMENTS WILL CONTAIN IMPORTANT INFORMATION. Investors and other interested parties may obtain the documents free of charge at the SEC's website, www.sec.gov, or from USG at its website, www.usg.com, or through a request in writing sent to USG at 550 West Adams Street, Chicago, Illinois 60661-3676, attention: Corporate Secretary. USG and its directors and executive officers may be deemed to be participants in the solicitation of proxies in connection with the 2018 Annual Meeting of Stockholders. Certain information concerning these participants is set forth in USG's definitive proxy statement, dated March 29, 2018, for its 2018 Annual Meeting of Stockholders as filed with the SEC on Schedule 14A. Additional information regarding the interests of these participants in the solicitation of proxies in respect of the 2018 Annual Meeting and other relevant materials will be filed with the SEC when they become available and as needed.